Dosa spread with mint chutney and grated carrot mixed with lemon juice and salt spread. Garlic – pods 2 or onion shallots 3 nos,grind in to smooth paste. Spread this green chutney on 1/4 th of Dosa. 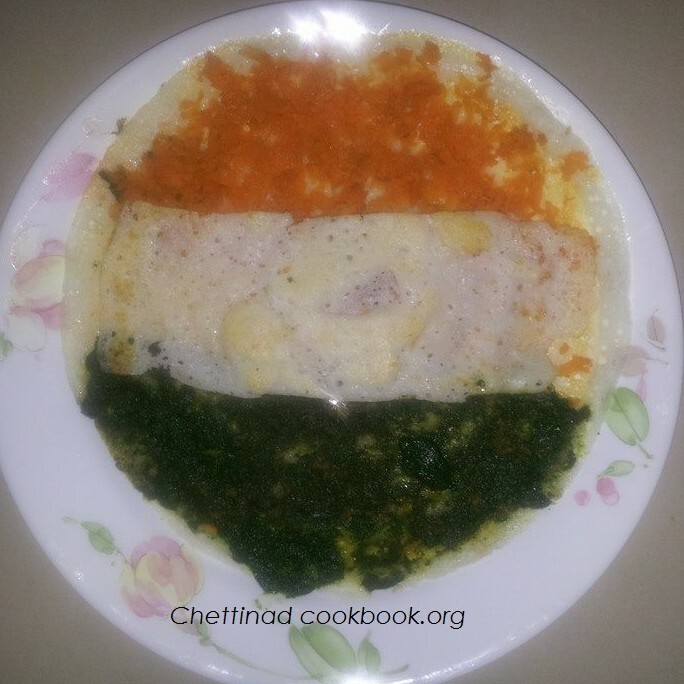 Leave 3″ inch space for white colour and spread rest with grated Carrot,to make Indian flag on Dosa. Indian Republic day Dosa is ready to serve with Pride. Note:Using it as raw chutney gives you the full nutritional value of greens. If you don’t like raw smell you can season it by heating one teaspoon of oil in a pan splutter some mustard seeds and add to the chutney.